And if the Mother House on Morningside Heights has a ho-hum attitude about what is supposed to be journalism’s most prestigious award, is it surprising that the working press is little impressed, the general public couldn’t care less, and many young would-be journalists don’t even know what we’re talking about? McCormally was writing in [MORE], the journalism review that had launched in the summer of 1971. His piece for the May, 1972 issue of [MORE] is a tell-all about the experience of being a Pulitzer judge, and the cursory once-over that the Pulitzer committee expected him to give each piece before bestowing the honor on “a good journeyman job by a veteran reporter” rather than on something exciting, groundbreaking, up-to-date and well-written. 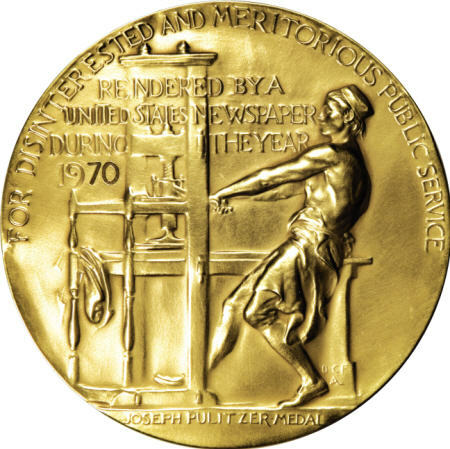 The Pulitzers, he wrote, did manage to dole out prizes to Sy Hersh or David Halberstam when they did truly outstanding work, but for the most part they looked for solid middle-of-the-road journalism that was uncontroversial, and that ran in the same few mainstream newspapers. Mostly, McCormally seemed to be bothered by the exclusion of women (though there was one black man serving as a judge); by the expectation that judges would spend very little time with the work (his committee was give 12 hours over two days to judge 134 nominations of up to ten articles each); and by the bland and predictable choices that the process turned up. I, for one, am not bothered.